Hello and welcome to the 423rd installment of the SWD. Unknown gunmen opened fire on a Hayat Tahrir al-Sham’s vehicle on the road between Kafr Nabl (Kafranbel) and Hazarin, killing one and wounding one element. Improvised explosive device targeted a vehicle of the “Security Force” in front of a building of the International Red Crescent near Al-Hizb roundabout in Al-Dana. The explosion wounded two elements of the “Security Force” and wounded four individuals, including two civilians. Improvised explosive device targeted a vehicle of the Free Syrian Army’s Jaysh al-Nasr at the outskirts of Maarat Misreen, killing one and wounding one element. Similarly, an improvised explosive device targeted a vehicle of Jaysh al-Ahrar in the vicinity of Saraqib, wounding an element of the group. Body of Abdullah Shawki al-Dali, member of a political body in Idlib governorate was found near the city of Salqin. Al-Dali was kidnapped by unknown gunmen a month ago. Fourth batch of rebel elements and their families were evacuated from the Northern Homs pocket and arrived at Qalaat al-Madiq crossing in western Hama. The batch reportedly consisted of around 4500 rebel elements and civilians, who will be transferred to camps for internally displaced persons in Aleppo and Idlib governorates. Fifth batch of rebel elements and their families started evacuating from the Northern Homs pocket, towards northern Syria. Syrian Arab News Agency stated that more than 30 buses carrying fighters and civilians left the aforementioned localities towards northern Syria. 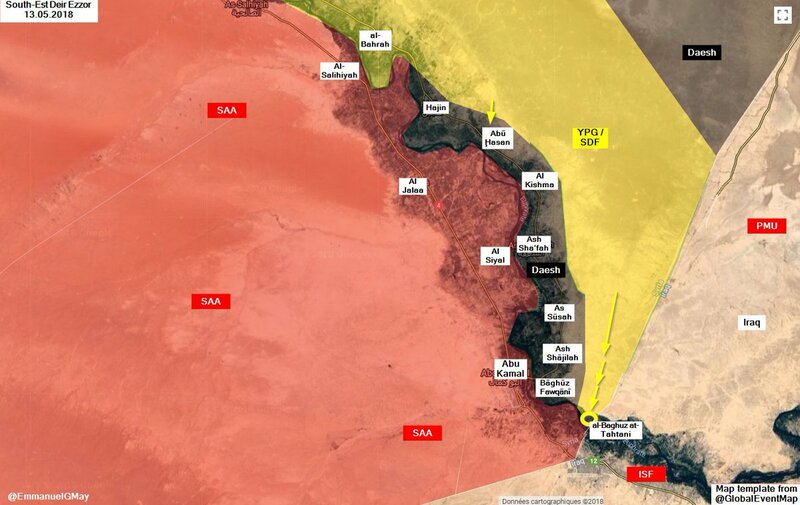 Syrian Democratic Forces clashed with the Islamic State in the village of Al-Baghouz in eastern Deir al-Zour, and reportedly captured the locality after several hours of clashes. However, several reports stated that clashes with the Islamic State still continue in the locality. Detailed situation around Al-Baghouz can be found here. 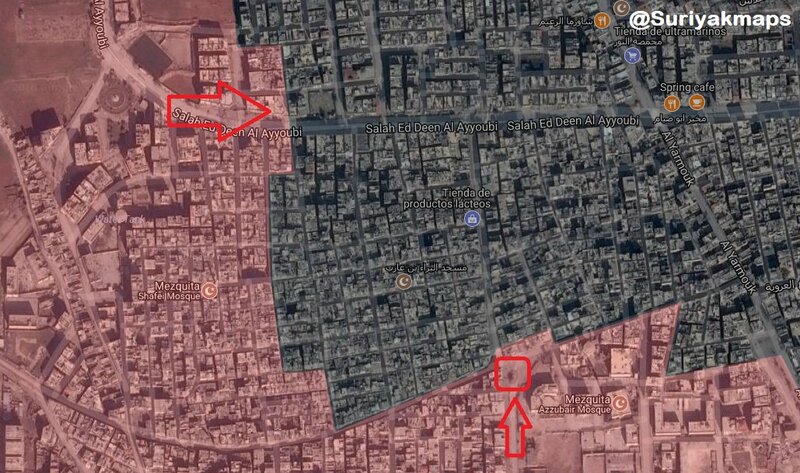 Syrian Arab Army and allies made additional limited advances in Al-Yarmouk camp and Al-Hajar al-Aswad against the Islamic State. Syrian Arab Army reportedly captured Al-Rus roundabout and Assad ibn al-Furat school. Detailed situation in Al-Yarmouk can be found here. Islamic Emirate of Afghanistan (Taliban) attacked Afghan National Security Forces’ positions in Qara Sheikhi area of Juma Bazar district. Islamic Emirate of Afghanistan overran the aforementioned area by capturing two military bases and three posts, killing six elements in the process. Islamic Emirate of Afghanistan seized four armored vehicles, a DShK heavy machine gun, five PK machine guns, an RPG launcher, 20 assault rifles, and large quantities of ammunition from the captured localities. Islamic Emirate of Afghanistan overran two Afghan National Army’s checkpoints in Gorzad area of Shirin Tagab district, capturing four soldiers in the process. Islamic Emirate of Afghanistan seized three armored vehicles, five PK machine guns, and five assault rifles from the checkpoints. Similarly, the Islamic Emirate of Afghanistan overran two Afghan National Army’s checkpoints in Chahar Sangi area of Dawlat Abad district. Afghan National Security Forces killed five and wounded three elements of the Islamic Emirate of Afghanistan in Chimtal and Chahar Bolak districts. Islamic Emirate of Afghanistan seized an Afghan National Army’s post in Archi (Dasht-e Archi) district. Reports suggest that 14 elements of the Afghan National Army were killed and four wounded, as well as two armored vehicles destroyed in the encounter. Afghan National Security Forces killed three elements of the Islamic Emirate of Afghanistan in Jurm district. Afghan National Security Forces killed two and wounded three elements of the Islamic Emirate of Afghanistan in the province. Afghan National Security Forces killed 21 elements of the Islamic State in Deh Bala (Haska Meyna) district, according to the Afghan Ministry of Defense. Islamic State’s Amaq Agency stated that an SVBIED operation targeted the headquarters of the Afghan Ministry of Finance in the city of Jalalabad, capital of Nangarhar Province. Reports suggest that nine individuals were killed and 36 wounded by the explosion, including civilians and elements of the Afghan National Police. Islamic Emirate of Afghanistan killed two elements of the Afghan Local Police and destroyed two vehicles in Mir Haider area of Shindand district. Islamic Emirate of Afghanistan conducted a large-scale operation against the Afghan National Security Forces in Awshan area of Shahrak district. According to the reports, the Islamic Emirate of Afghanistan captured all posts in Awshan area, killing 15 and wounding ten elements of the Afghan National Security Forces in the process. Islamic Emirate of Afghanistan seized seven armored vehicles, two pickups, a Kamaz truck, 50 motorcycles, two DShK heavy machine guns, two PK machine guns, and eight assault rifles from the encounters. Islamic Emirate of Afghanistan seized two Afghan National Police’s posts in Khwaja Umari district. Seven elements of the Afghan National Police were killed, as well as two motorcycles and a vehicle destroyed in the encounters. One element of the Islamic Emirate of Afghanistan was killed in the clashes for the posts. Afghan National Security Forces killed seven and wounded two elements of the Islamic Emirate of Afghanistan in Chora district. Islamic Emirate of Afghanistan’s snipers killed five elements of the Afghan National Army in Bazar area of Khas Urozgan district. Afghan National Security Forces killed 34 and wounded nine elements of the Islamic Emirate of Afghanistan in Arghandab district, according to the Afghan Ministry of Defense. Islamic Emirate of Afghanistan overran three Afghan National Army’s checkpoints in Arghandab district, reportedly killing more than 18 soldiers and wounding a dozen more. Afghan National Security Forces killed eight and wounded three elements of the Islamic Emirate of Afghanistan in Nad Ali and Nawa-I-Barakzayi districts. Islamic Emirate of Afghanistan responded to an Afghan National Security Forces’ attack in Kakarno area of Nawa-I-Barakzayi district, killing and wounding seven elements. Islamic Emirate of Afghanistan overran an Afghan National Security Forces’ checkpoint in Gorki area of Nawa-I-Barakzayi district. At least three elements of the Afghan National Security Forces were killed and two motorcycles destroyed in the encounter. Islamic Emirate of Afghanistan downed an Afghan Air Force’s helicopter in Nahri Saraj district. Islamic Emirate of Afghanistan’s snipers killed two elements of the Afghan National Army and two elements of the Afghan Border Police in Nad Ali district. Afghan National Security Forces killed five and wounded four elements of the Islamic Emirate of Afghanistan in Maywand district. Two Islamic Emirate of Afghanistan’s improvised explosive devices destroyed an Afghan National Army’s pickup and an armored personnel carrier in Jalahor Bawri area of Arghandab district. Similarly, an Islamic Emirate of Afghanistan’s improvised explosive device killed and wounded six elements of the Afghan National Army in Mano area of Shah Wali Kot district. Islamic State’s element killed one and wounded four individuals in the city of Paris by stabbing, before he was neutralized by security forces. Islamic State’s elements conducted three suicide attacks, targeting three churches in the city of Surabaya. Islamic State’s Amaq Agency stated that 11 individuals were killed and 41 wounded by the three attacks.